Authors : Abhi K. Srivastava1, R. Erdélyi2, D. Tripathi3, V. Fedun2, N.C. Joshi1, P. Kayshap1. 1Aryabhatta Research Institute of Observational Sciences (ARIES), India. 3Inter-University Centre for Astronomy and Astrophysics (IUCAA), India. The excellent high-resolution data from the Transition Region and Coronal Explorer (TRACE), Hinode, and the Solar Dynamics Observatory (SDO) missions opened a new era in the detection and interpretation of various non-linear processes in the solar atmosphere. A wide range of MHD instabilities have been observed in recent years in association with various solar dynamical processes. For example, evidence of coalescence instability has been discovered in loop–loop interaction ; Breakup and finger-like structures in down-flowing plasma is interpreted as a signature of the Rayleigh–Taylor instability ; Ballooning and torus instabilities have been reported as one of the prominent mechanisms for flux rope eruptions ; Kelvin–Helmholtz and Alfvénic instabilities in the solar corona are also observed and theorised [4,5,6]. The kink-unstable mode of cylindrical magnetic flux tubes is ubiquitous in the solar corona [7,8]. However, another type of instability known as the sausage instability (m = 0) mode, which is theoretically investigated in astrophysical plasma [7,9,10], has – to the best of our knowledge – not yet been observed in the solar atmosphere (although it is worth mentioning that sausage oscillations of the stable flux-tubes are well-observed [11,12,13]). In this nugget, we outline in brief the discovery of the sausage-pinch instability in the solar corona, in an activated partial filament eruption observed by SDO/AIA. The Lorentz force and the pinch-instability in a magneto-plasma cylinder can be generated either by an axial current or by the presence of an ambient longitudinal magnetic field. In the first case the internal current jz generates an azimuthal magnetic field Bθ around itself in the plane which is perpendicular to the axis, and its interaction with the induced magnetic field causes the evolution of the z-pinch instability (cf., Figure 1, left-panel : ‘a’). In case (a) of the z-pinch instability as shown in Figure 1, when sausage perturbation is superimposed on the flux tube, the magnetic field, Bθ, (blue cylindrical arrows) grows in the neck region due to the current jz (dashed red arrows) inside the magnetic flux tube increasing in a smaller cross-section. Additional magnetic pressure produces a Lorentz force (F) that tends to constrict the plasma cylinder. On the other hand, when the longitudinal magnetic field inside the flux tube varies along its radius at a particular height, then it induces an azimuthal current (jθ). During interaction of this current with the ambient magnetic field, Lorentz force is generated in the inward direction, which confine the plasma in cylindrical geometry and known as θ-pinch instability (cf., Figure 1, right panel : ‘b’). At the loci where the plasma column is pinched it can be stabilized against the sausage z-pinch instability by a longitudinal field that is significantly dominant over the azimuthal component of the magnetic field [7,14]. The θ-pinch is neutrally stable and thus the stability also depends on additional ambient magnetic fields and localized conditions . Either mechanism, as described above, may trigger the sausage instability in the magnetic flux tubes of the solar corona. Figure 1 : Schematic of the physical mechanism of sausage instability in z-pinch (a) and θ-pinch (b) of the plasma cylinder . 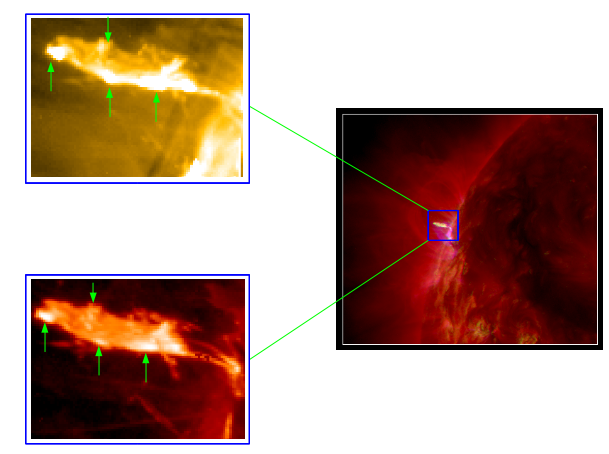 Figure 2 : The right-most composite SDO/AIA image displays AR11295 on 12 September 2011 before a C-class flare, which is showing an activated part of the flux-tube. The zoomed view of the magnetic flux-tube is shown in AIA 193Å (left-top) and 304Å (left-bottom) with the evolution of brightened sausage knots as well as pinched regions in-between . We recently discovered the first observational evidence of the evolution of the sausage-pinch instability. The observations was made during a prominence eruption in Active Region 11295 on 12 September 2011, observed by the Atmospheric Imaging Assembly (AIA) on board the Solar Dynamics Observatory (SDO). We observe a magnetic flux tube visible in AIA 304Å, which shows curvatures on its surface, with variable cross-section and enhanced brightness and emissions (See Figure 2). These curvatures evolved and thereafter smoothed out within a time-scale of 60 seconds. The curved locations on the flux tube exhibit a radial outward enhancement of the surface of about 1-2 Mm from the equilibrium position, and AIA 193Å snapshots also show the formation of bright knots and narrow regions in between, at the same four locations where 304Å brightenings are seen (Figure 2, and ). The formation of bright knots and the narrow regions over an entire magnetic flux tube within a 60s time-scale, may be the morphological evidence of the sausage-pinch instability. We also find evidence of flows of confined plasma in these bright knots along the magnetic field lines. This dynamical behaviour of this flux tube is most likely generated by the dominance of the longitudinal magnetic field components over short temporal scales [7,16]. 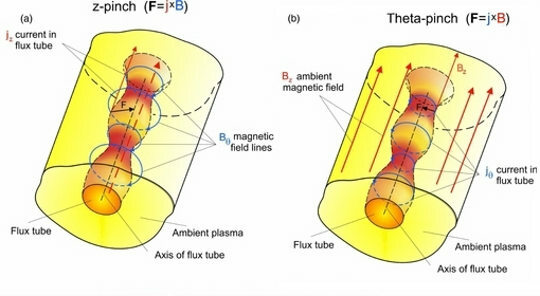 The observed longitudinal motion of the plasma and, therefore, the stretching of the frozen-in magnetic field further reduces the curvature, and the plasma confinement, and stabilises the observed dynamic flux tube against the instability. The first detection of the evolution of sausage-pinch instability is important as the occurrence of such perturbations is highly dependent upon the local plasma and flux-tube conditions . These types of magnetic instabilities can act as canonical plasma processes to trigger large-scale solar eruptions [1,2,4,17]. Therefore, the first imaging detection of the sausage instability  adds one more physical process which was only established in theory previously, but is now present in the observations. This observational evidence will also provide further clues for laboratory plasma physicists to understand such plasma processes at laboratory scales . Kumar, P., Srivastava, A. K., Somov, B. V., Manoharan, P.K., Erdélyi, R., Uddin, W., 2010, ApJ, 723, 1651. Innes, D.E., Cameron, R. H., Fletcher, L., Inhester, B., Solanki, S. K., 2010, A&A, 540, L10. Tsap, Y. T., Kopylova, Y. G., Stepanov, A. V., Melnikov, V. F., Shibasaki, K., 2008, Sol. Phys, 253, 161. Foullon, C., Verwichte, E., Nakariakov, V.M., Nykyri, K., Farrugia, C. J., 2011, 729, L8. Ofman, L., Thompson, B. J., 2011, ApJ, 734, L11. Taroyan, Y., 2010, A&A, 533, 68. Aschwanden, M. J., 2004, Physics of the Solar Corona. Srivastava, A.K., Zaqarashvili, T.V., Kumar, P., Khodachenko, M.L., 2010, ApJ, 715, 292. Priest, E. R., 1982, Dordrecht, Holland ; Boston : D. Reidel Pub. Co. ; Hingham,, 74P. Sturrock, P. A., 1994, Plasma Physics, An Introduction to the Theory of Astrophysical, Geophysical and Laboratory Plasmas, ISBN 0521448107, Cambridge University Press, 1994. Melnikov, V. F., Reznikova, V. E., Shibasaki, K.; Nakariakov, V. M., 2005, A&A 439, 727. Inglis, A.R., Nakariakov, V.M., Melnikov, V. F., 2008, A&A, 487, 1147. Morton, R. J., Erdélyi, R., Jess, D. B., Mathioudakis, M., 2011, ApJ, 729, L18. Kadomtsev, B. B., 1966, Reviews of Plasma Physics, 2, 153. Freidberg, J. P., 1982, Reviews of Modern Physics, 54, 801. Srivastava, A.K., Erdélyi, R., Tripathi, Durgesh, Fedun, V., Joshi, N.C., Kayshap, P., 2013, ApJL, 765, id. L42. Hillier, A., Isobe, H., Shibata, K., & Berger, T., 2012, ApJ, 756, 110. Moser, A. L.; Bellan, P. M., 2012, Nature, 482, 379. Acknowledgments : We acknowledge the use of the SDO/AIA observations for this study. R.E. acknowledges M. Kéray for patient encouragement and is also grateful to NSF, Hungary (OTKA, Ref. No. K83133) for financial support received. A.K.S. also thanks Shobhna Srivastava for her support and encouragement. V.F. thanks Dr. D. Vasylyev for his help with images preparation. D.T. acknowledges the support from DST under Fast Track Scheme (SERB/F/3369/2012-2013). A.K.S., N.C.J., and P.K. acknowledge the support of DST-RFBR Project (INT/RFBR/P-117). N.C.J. also thanks ARIES for providing the postdoctoral research fellowship.